Here's the first hack which I'm currently working on. 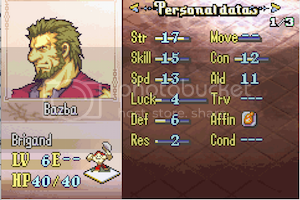 For simplicity, I decided to start with a difficulty hack to improve the gameplay of FE8. The aim of the hack is to ramp up Sacred Stone's difficulty via map design changes and enemy weapon/stat upgrades. Hard mode is recommended. Though there do exist some differences between Normal and Hard (i.e. reinforcement timings and additional enemies on Hard), Normal is not properly balanced right now since some chapters are the same as Hard while others, especially the first few chapters, are a lot easier (also Normal was not tested). 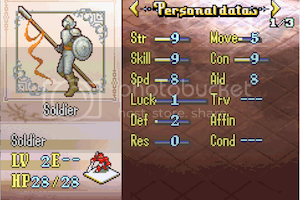 Apply the patch to an English FE8 ROM. Change log is provided for download in the link above. all im gonna say is that this does not look balanced. Though mind giving me a little more information? Which part does not look balanced? Also, I should mention that my goal is not to balance classes/characters. Some characters will be inherently better than others. I'm concerned from the screenshot that the design philosophy may have boiled down to just reducing the player's options. 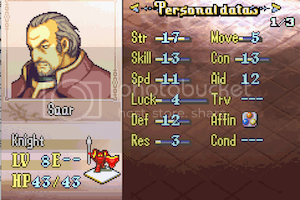 Take the Prologue, in which I'm assuming you basically have to send Seth to destroy everything in the east - Eirika can't stand up to O'Neill, Seth can't stand up to the Horseslayer guy. 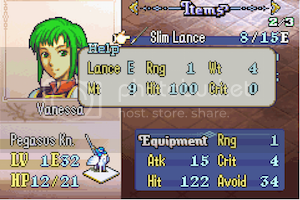 If Seth has been nerfed to the point where some random thief a few chapters in can one-round him, then Vanessa must be close to mandatory with her overpowered spear. 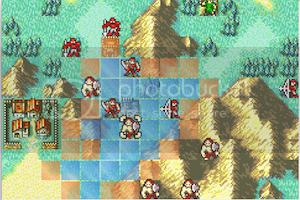 Anti-turtling measures are all well and good, but I'm concerned that combining them with enemies who are overwhelmingly strong will essentially lead to there being A Correct Way to clear every map, with A Correct Set Of Units to do so. 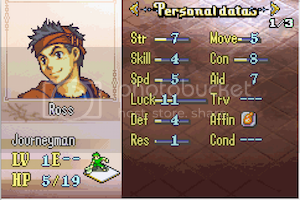 What good reason does the prologue have to have a boss with those kinds of stats? I understand perhaps if you do that in a few chapters from now, when you have a number of different units to take them down, but why the prologue? 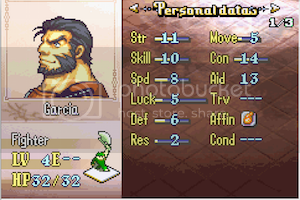 And I hardly see how this 'improves the gameplay' of FE8 at all. Like really, how are you supposed to beat that? And can it be beaten in any other way that isn't reliant on supreme luck manipulation? Because even from a glance, this looks like Seth's funhouse yet again. 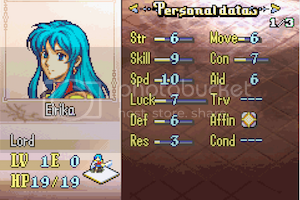 Cause I know for a fact Erika's base speed is lower than that of your new starting boss. 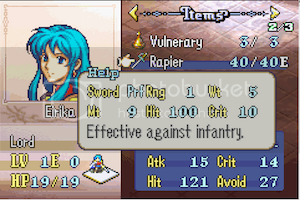 So unless there's been a buff to characters as well, Eirika only has just enough speed to not get doubled, which means her advantage as a speedy character is non existant and thus Eirika has to hit him 3 times in order to kill, while the boss has to hit only twice, and with 93 hit, its pretty likely that Eirika is dead. Which, once again, sounds like Seth has to clean up and do most of the work. I'm concerned from the screenshot that the design philosophy may have boiled down to just reducing the player's options. Take the Prologue, in which I'm assuming you basically have to send Seth to destroy everything in the east - Renair can't stand up to O'Neill, Seth can't stand up to the Horseslayer guy. 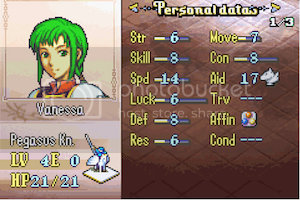 If Seth has been nerfed to the point where some random thief a few chapters in can one-round him, then Vanessa must be close to mandatory with her overpowered spear. 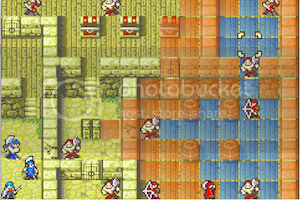 Anti-turtling measures are all well and good, but I'm concerned that combining them with enemies who are overwhelmingly strong will essentially lead to there being A Correct Way to clear every map, with A Correct Set Of Units to do so. Also this. 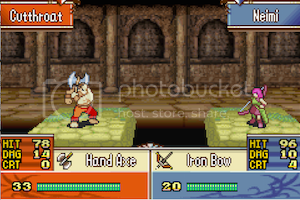 I criticized Sun God's Wrath of being the very same; a game in which you have only one option, and that is to succumb to the will of the hacker and use a very specific set of units with a specific set of weapons and movements, thus limiting variations on how someone could play, and thus a loss to replay value. If every time I play a chapter I have to send units to specific spots no matter what or I will end up in an unwinnable situation, I'm not going to want to play your game. I understand the idea of making a once easy game difficult, and I understand the idea of not every idea the player comes up with is good or will succeed, but if there is only one way to do things, then I am playing a puzzle game with needless luck involved, not a strategy game. I see much higher numbers everywhere, both on enemies and weapons. 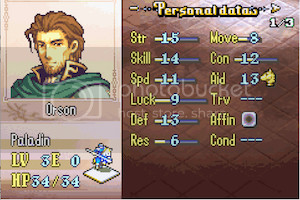 I don't like stat inflation as a way to make things harder. For a true difficulty hack, I think a smaller bump to numbers, slight adjustments to bases/growths/enemy inventories, and massive adjustments to enemy placement would be better. Some of the early game maps are a little "tight" in space giving you little movement which means that you'll have to be more a little more careful with your position. 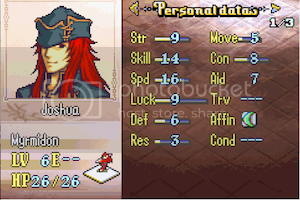 Seth won't be able to destroy everything by himself due to all the enemies having high attack. 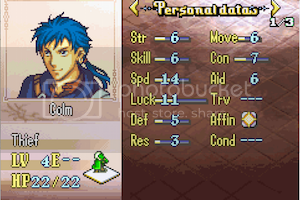 Also keep in mind that in the prologue Seth starts off with only 13 HP, so you'll have to be extra careful. Yes, Seth can't stand up to the Horseplayer guy (actually, he could if he used his silver lance), but that doesn't mean Erika can't. As for Erika vs. O'Neill, she can totally take on O'Neill if it is a 1v1 fight. 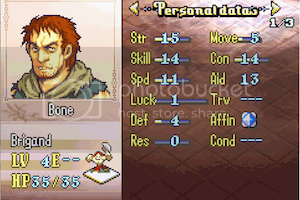 Both O'Neill and Erika deal 14 dmg to each other and the boss gets 3HKOd by Erika. 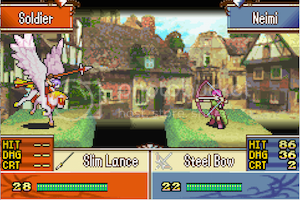 Boss hits Erika and Erika goes down to 5HP and retaliates. 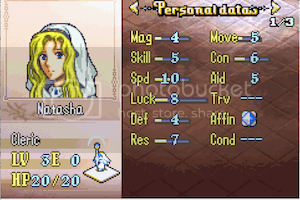 On Player Phase, just have Erika use a vulnerary to go back up to 15HP. 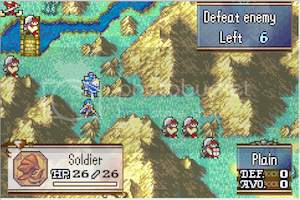 Enemy Phase boss attacks again and Erika drops down to 1HP, but that's fine because on Player Phase Erika attacks and finishes off the boss. You see, the enemy aren't as tough as they seem defensively, they have a lot of HP, but their true bulk is disguised by the fact that they only having paper tissues for armors. Take O'Neill for example, even though he has 36 HP, he only has a pitiful 2 DEF, this allows Erika to deal massive damage to him and KO him in 3 hits (Seth kills him in 2 Hits with an iron sword). As a matter of fact, majority of the early game enemies gets killed off in about 2 hits, that's it. Some of them gets straight up ORKOd or even OHKOd. 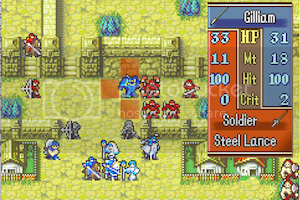 Take the sword Cavaliers in Chapter 1, they have 28 HP and 5 DEF, a little calculation shows that base Erika exactly one shots these guys; Erika also two shots all the early game fighters (they have 30 HP and 1 DEF, so at base, Erika does exactly 15 dmg per hit to these guys). As for Seth getting ORKOd by the thief, that image was a little misleading, I should probably put up a better one. The thief was wielding a light brand and as you can see above, Seth has no resistance and I also didn't give him any pure water. I believe that thief also happened to proc an extra point of SPD, he should have 13/14 SPD if I remember correctly. But here's the thing, light brand gets the 1/2 STR dmg at range, so if you need to do some chip damage first, just attack him from the distance, base Arthur can do the chip job even without pure water. Vanessa can totally take him at close range and Erika should be able to do it as well. Chip damage + somebody like Seth, Gilliam or even Garcia should be able to finish the guy. One last thing I would like to say is that I think that people are too focused on enemies having high attack, speed and HP, but don't realize just how quickly these enemies fall. Just because Seth can't kill an enemy by himself doesn't mean that it's game over. 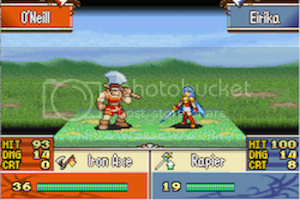 The rest of the cast are not useless by any means, this hack is designed so that enemies have high attack but low defence, which means everyone of your characters can deal massive damage to the enemies. 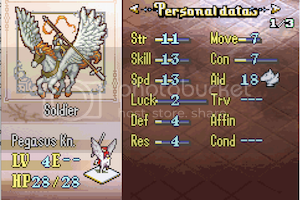 Take Erika vs. the fighter example from above, Erika KOs the 30 HP fighters in 2 hits, guess what, so does Seth. Do you see the implications here? It means that Seth isn't killing enemies that much better than the rest of the cast (though he's got more bulk and a horse). 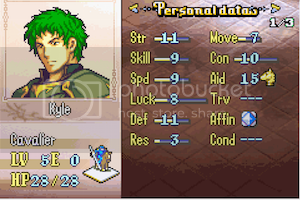 Or conversely, I should say that the rest of your cast can almost kill enemies just as well as Seth now. 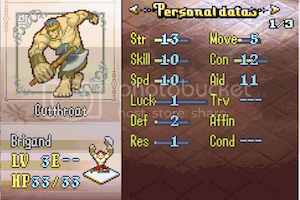 As mentioned in the above reply, the aim of the design here is to beef up enemy's offensive stats. Enemy defences largely remains the same as in the original game. As a matter of fact, I reduced their defences in the early game (I'll put up more screen shots of the actual enemy stats because right now a lot of the pictures are emphasizing the enemies' attack prowess). It's not a mindless stat inflation, I only buff certain stats to make them better at doing the job that they're supposed to do (which is to deal consistent damage to the player), I didn't make them into infallible tanks. Since you played the DS games, I take it you're familiar with their H5/Lunatic design philosophies. The aim here is pretty similar, it's hard for you to tank, it's hard for you to dodge. But on the other hand, killing enemies are not very difficult due to them having no defence and the weapons having better MT and HIT. 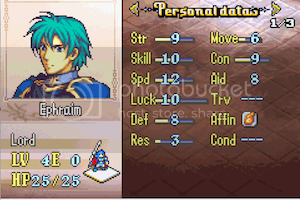 Honestly, what's the point of massive adjustment to the enemy placement when you can simply send Seth into their midst and he takes like 1 dmg from every enemy whilst ORKOing them in return? I need to buff up their attack power so that they can actually be a threat. Also, only the first 2/3 chapters have similar placements to the original game, the rest have been changed (though most of the actual maps themselves still remain unchanged). Another thing not shown in the screen shots is that you get access to better weapons lot faster. Slim weapons are available starting from chapter 2, steel/steel+ are available starting from the end of chapter 5 and you can even buy Elfire/Divine tomes at the end of chapter 6. Also, I've added in more stat boosters in the early game, i.e. chapter 4 thief drops an Angelic Robe, Joshua comes with an Energy Ring (you still get the Energy Ring in Chapter 7 as well as the Angelic Robe in Chapter 8, so that's an extra robe and an extra ring), Chapter 8 also has Boots in one of the chests. I think that's should be more than enough to beat the first 8 chapters. 1. Don't post twice in a row, unless you're announcing a new patch or something. Use the little plus sign next to the Quote button to enable Multiquote. 2. The DS games worked because numbers were overall lower. If you want to go that route, you'll need to overhaul everyone's bases. 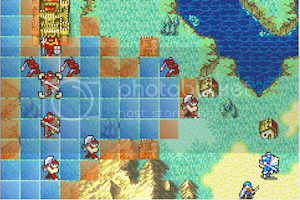 The other challenge of the DS games was enemy positioning. 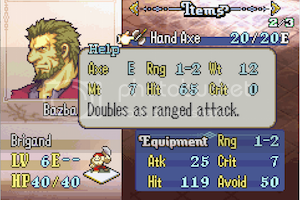 Some enemies didn't exist on the lower difficulties, and FE12 changed some item drops (most notable being the lack of Warp). 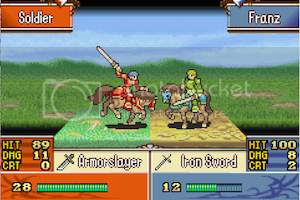 Even then, Marth's games were a lot more flexible, thanks to reclassing and orbs/shards. I suggest dialing back bases before adding to them - the numbers won't be as big and shiny, but it still works. Yes, all the characters have been buffed (except Seth), both their bases and their growths (Seth still got a growth buff). I've uploaded screen shots of the new bases for all the characters that join in the first 8 chapters, you can check them out. Seth can't do all the work. 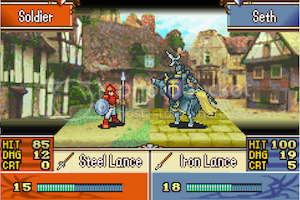 For example, in the prologue, the boss does 9 dmg to Seth while the other fighters do between 7 and 8, and considering Seth starts out with 13HP in the prologue, he can't just keep tanking, especially when one of the guys have a horseslayer. 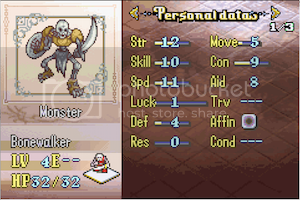 Regarding the Prologue boss, as mentioned in the above post, in a 1v1 fight, Erika can beat him without relying on any crit or dodges. Both deal 14 dmg to each other and boss dies in 3 hits to Erika. 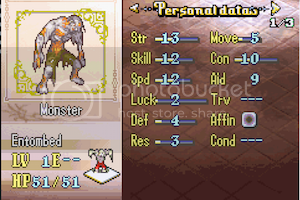 Let the boss attack Erika first, she drops to 5 HP and retaliates. On Player Phase, use a vulnerary which brings her back up to 15 HP. Enemy Phase boss attacks again which drops Erika down to 1 HP and Erika retaliates, so that's two hits on the boss already. 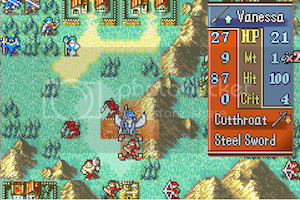 On Player Phase, Erika attacks and deals the final blow. There, nothing complicated. No RNG involved. 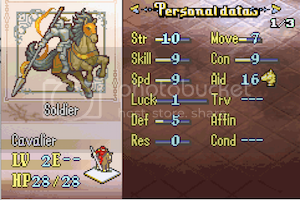 Sure Erika barely survives with 1 HP, but it doesn't matter, as long as you have at least 1 HP, you're golden. A lot of time you will be barely surviving with < 5HP, and that's what the difficulty hack should be like. With proper planning, you can mitigate most of the RNG, hence why I buffed the weapon hit rates, so the player won't miss. Also don't expect to dodge, it's not happening unless you've got enough avoid + WTA + terrain bonus on your side. If you're afraid that it's gonna end up being just throw Seth at everything to solve it, I can tell you this, it won't be (probably, I hope?). It's very hard to tank in this game, it's also very hard to dodge in this game. 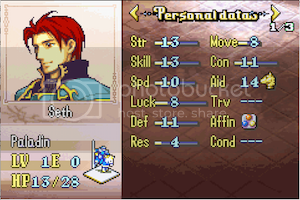 Once you get to around Chapter 6 or 7, you'll see that Seth can't solo and he can't tank. He can maybe take 2 hits and barely survive and that's about it. So you'll HAVE TO rely on using other characters as well because you absolutely need to spread out the damage amongst different units. That is what you want, I presume? Obviously some units will be better than others, but I don't think you're automatically screwed if you decide to use less optimal units, but it will definitely be a lot harder. 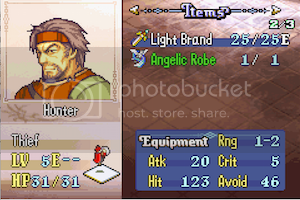 In the game, I have supplied you with extra stat boosters (you get an extra angelic robe in Chapter 4, and Joshua comes with another Energy Ring in Chapter 5, Chapter 6 boss also has a stealable speedwing). On top of this, the game gives you access to slim weapons starting from Chapter 2, steel/steel+ weapons (which are basically silver weapons with higher WT but low weapon rank requirement) starting from the end of Chapter 5, and even Elfire and Divine tomes are available after Chapter 6. All of these act as a buffer if you messed up and didn't use the right characters, or your characters got screwed and can't deal enough damage, etc. 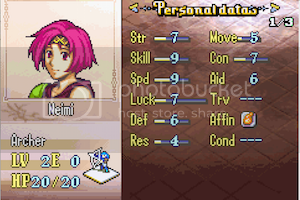 Say for example, you didn't use Neimi, and when you get to Chapter 7, you see there is a bunch of Wyvern Lords. That's ok, just go back to the world map, go to the Chapter 5 armoury, and buy her a Steel Bow+ which has 13 MT and only a D rank requirement, so even base Neimi can do massive damage with the right weapons. Hopefully these extra early game weapons and resources provide you with more leniency towards how you choose to play. Obviously this doesn't mean that every play style, every choice, no matter how poorly made, will end up allowing the player to beat the chapters. At some point, there is gonna be a cut off. If the player really really messed up, then there is not much I can do. Oops, just did it again, didn't see your comment until I've made the above post. Yes, I've upped everyone's bases as well as their growths. I'm not sure if you've seen the pictures with all the characters and their join stats. 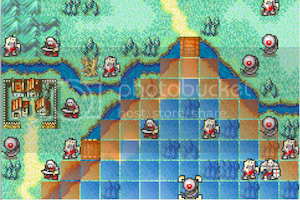 Again, regarding the enemy position, they are not the same as the original game. 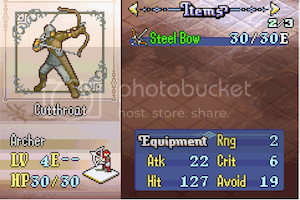 If you look at the screen shot, there is an armour slayer in chapter 1 (on Normal mode that guy only has a slim sword), one of the archers in chapter 3 has a long bow, etc. Enemy AI and placements have been reworked, there are now groups of enemies that you can't bait out one by one, they wait until you get inside the range of the guy at the back before they attack. There are early promoted enemies, i.e. Snipers in Chapter 6 and Chapter 8, Wyvern Lords in Chapter 7 and Bishops in Chapter 5x and 8. Also new event changes have been added. For example, the lone thief in Chapter 3 now has a door key, he starts moving towards the door by the end of second turn, when he opens the door, the enemies inside will rush towards you. This is to prevent the player from dilly-dallying outside and taking sweet time killing the brigands from the other side of the wall. Item drops have also been changed, like I've said above. You get a lot more stat boosters in the first 8 chapters (you now get 2 Energy Rings, 2 Angelic Robes, Speedwing, DracoShield, Skill Book, Goddess Icon and even Boots). All the promotion items have been changed to Master Seals so you can promote who ever you see fit. Natasha joins with a 5 use Rescue as well. Stronger weapons have been made available to you a lot earlier. Though I realize a lot of flexibility is gone without reclassing, shards and forging, I try to give you more options via the above items as well as letting player early access to Steel+ weapons, which are essentially silvers with more weight and a D rank requirement. Really, I didn't just go and buff up the enemy bases and called it a day. I changed their weapons, placement, AI, events as well as obtainable items and shop items. I've gone through the first 8 chapters on Hard, and I didn't have too many issues myself but that's because I knew what I was doing, which is why I wanted to get some feedback from others. My last sentence suggested doing the opposite of what you did. 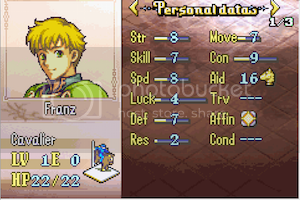 I'm not interested in playing Stat Inflation Emblem. When I said "overhaul enemy placement" I don't mean swapping inventories. I mean physically moving enemies, and possibly varying their classes. In the end, what I see is still a numbers game, albeit one that doesn't look fun due to large numbers for no reason. 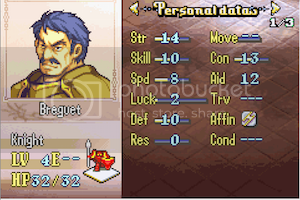 Take Fates - its hardest difficulty ups the enemies and skills, instead of stats. 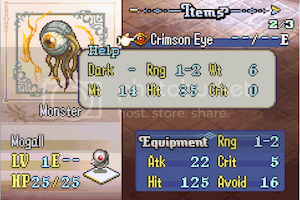 FE12 was good, in terms of difficulty, because the enemies wouldn't OHKO you unless you seriously screwed up, and by the time they got properly scary, you had the tools necessary to deal with them. For example, you got Parthia (and its user) for the wyverns, dragon-killing weapons before the dragon spam in midgame, support bonuses/Rainbow Tonic to cut down on the early ice dragon crits/hit other stat benchmarks, shards everywhere, and the various spheres could be passed around until near endgame. 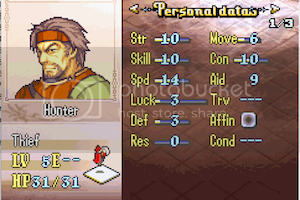 Units and stats were highly customizable, which is why having both enemies and players in 3HKO range worked. 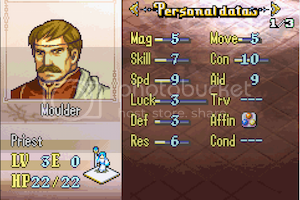 FE8 doesn't have that kind of flexibility, which means that it'll take a lot of coding, thought, and effort to create a true difficulty patch. 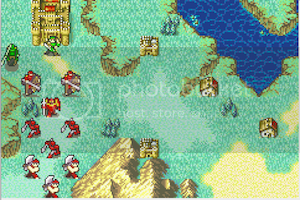 One day, I'll be arsed enough to examine every last detail of FE8, and completely redo some of the maps. When I said "overhaul enemy placement" I don't mean swapping inventories. I mean physically moving enemies, and possibly varying their classes. How do you know I didn't do this? I never said all I did was swap their inventories. All those examples I just gave to you above, I said I changed their trigger events, I changed where the units are placed, I added new enemies and removed some of the old ones. And yes, enemies DO MOVE, that thief opening door example I just mentioned to you in the previous post, isn't that one example of physically moving enemies? I don't know why you're just hard set on believing that all I did was simple inventory swapping and buff up some numbers when I've already given you examples that show more than just these. The maps are dynamic, enemies are always moving (well, most of the time anyways). That's my take when designing maps, there should always be something happening/changing on the map, this causes the player to be weary and ready to move because what might seem like an advantageous position might turn into a death trap the very next turn. In the end, what I see is still a numbers game, albeit one that doesn't look fun due to large numbers for no reason. 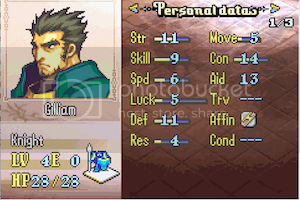 Take Fates - its hardest difficulty ups the enemies and skills, instead of stats. Well, it's hard to avoid the numbers game due to the lack of features in the GBA games. 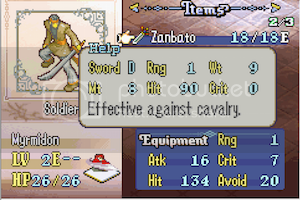 FE12 was good, in terms of difficulty, because the enemies wouldn't OHKO you unless you seriously screwed up, and by the time they got properly scary, you had the tools necessary to deal with them. For example, you got Parthia (and its user) for the wyverns, dragon-killing weapons before the dragon spam in midgame, support bonuses/Rainbow Tonic to cut down on the early ice dragon crits/hit other stat benchmarks, shards everywhere, and the various spheres could be passed around until near endgame. Again, it sounds like you believe that I didn't give you any of these equipments to deal with the challenges you'll be facing. 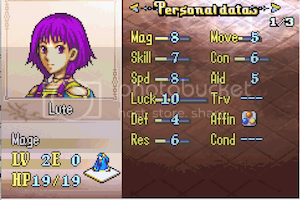 Your units won't die to a OHKO unless they're mages/healers or unless you've been screwed. 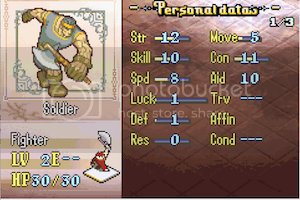 Units and stats were highly customizable, which is why having both enemies and players in 3HKO range worked. 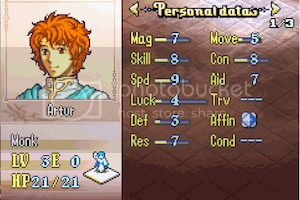 FE8 doesn't have that kind of flexibility, which means that it'll take a lot of coding, thought, and effort to create a true difficulty patch. 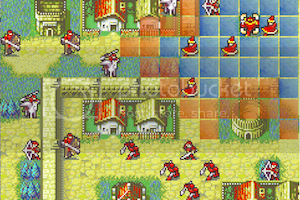 One day, I'll be arsed enough to examine every last detail of FE8, and completely redo some of the maps. 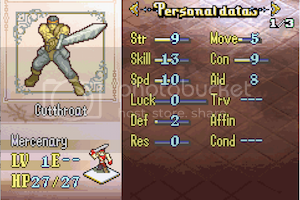 Yes, FE8 not having that flexibility is an issue. So for now, I've given you extra stat boosters, more powerful weapons that you can easily use in the early game in order to compensate, hopefully. Anyways, maybe I should make a recording of the prologue and the 1st chapter. It should be easier to see how the game plays out and what I am aiming for instead of just some screen shots which mostly shows nothing but stats.